The Cummins L9 diesel for 2017 delivers outstanding productivity and the best power-to-weight ratio in its class. Proven reliability keeps your trucks on the road longer. Faster, more accurate service provides even greater uptime, and customers can expect up to 15 percent better fuel economy over the engines of the last decade.But the most important component we put in every L9 engine is the trust that comes from a legacy of over 27 years and 5 million engines. The L9 comes from a family of proven performers, with a heritage that gets stronger every year. High-strength components, together with features such as replaceable cylinder liners for easier rebuilding, do more than add life to the engine; they also add to its residual value. The L9 is designed to excel in some of the toughest duty cycles. Cummins designs and manufactures our own engines and aftertreatment systems. In doing so, we’re providing customers greater performance, uptime, durability and efficiency. The L9 for 2017 features a new Single Module™ aftertreatment system that is not only compact, but also has greater thermal efficiency, for improved engine operation. The ISL9 features common technology with the Heavy-Duty ISX15 and ISX12 for exceptional performance. Common components include the XPI fuel system, a high-capacity Electronic Control Module (ECM) and the patented Cummins VGT™ Turbocharger from Cummins Turbo Technologies. Ratings range from 260-380 hp (194-283 kW), with 550 lb-ft of clutch engagement torque. Optional features include engine braking for better control, Rear-Engine Power Take Off (REPTO) and Front-Engine Power Take Off (FEPTO). We’ve refined the 2013 ISL9 to deliver up to 2% better fuel economy versus the 2012 model by adding an air intake throttle that makes the EGR system more efficient and modifying the VGT™ Turbocharger to make it more efficient as well. 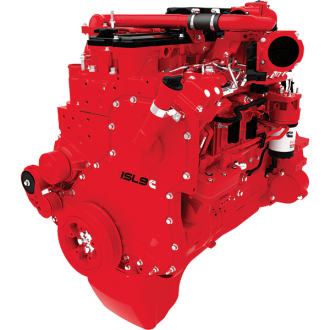 As a result, Cummins ISL9 meets the 2014 greenhouse gas (GHG) and fuel efficiency regulations a full year ahead of schedule. Even better is the fact that maintenance intervals and related costs remain virtually unchanged. This, together with better fuel economy, delivers a lower total cost of operation to ISL9 owners. The Cummins B6.7 for 2017 is more efficient, with up to 7 percent better fuel economy over the EPA 2013 ISB6.7, with the highest gains in key duty cycles running at lower speeds and in inner-city operations. One contributing factor to the fuel economy improvement is the fully integrated Single Module™ aftertreatment system, which incorporates a flowthrough design and optimized heat management. There are two distinctly different B6.7 versions from which to choose. 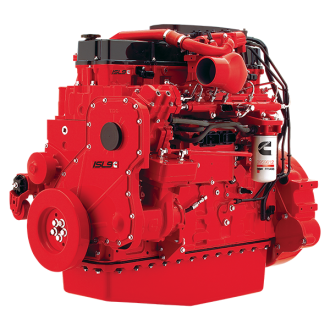 Customers looking to maximize fuel economy with the lowest possible cost of operation should select one of our efficiency ratings from 200 hp to 260 hp (149-194 kW). B6.7 engines in this ratings family have a unique combustion formula that, together with improved airflow through the aftertreatment and modifications to the VGT® Turbo, add up to an additional 7 percent fuel economy improvement over the EPA 2013 ISB6.7. Customers who need additional power and torque should opt for B6.7 performance ratings from 280 hp to 325 hp (209-242 kW). Peak torque ranges from 660 lb-ft to 750 lb-ft (895-1017 N•m). 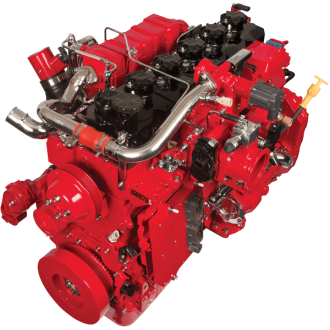 In 2016, Cummins Westport will introduce a new dedicated natural gas engine for transit, shuttle and school bus, medium-duty truck, and vocational vehicle markets. Based on the Cummins ISB6.7 diesel platform, the Cummins Westport ISB6.7 G will offer up to 260 hp (194kW) and 660 lb-ft (895 Nm) of torque, and will be available with automatic transmissions. Certified at launch to 2016 U.S. Environmental Protection Agency (EPA) and California Air Resources Board emissions standards, the ISB6.7 G will also meet 2016 EPA GHG requirements. 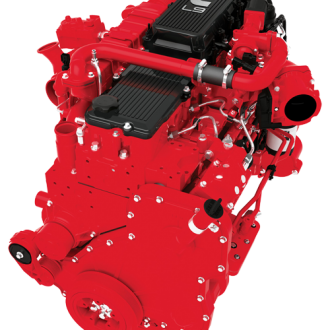 The ISB6.7 G features the same advanced combustion controls with Three-Way Catalyst (TWC) as Cummins Westport’s ISL G & ISX12 G engines. It operates on 100 percent natural gas, which can be carried on the vehicle in either compressed or liquefied form (CNG / LNG respectively). It can also run on 100 percent biomethane or renewable natural gas, which meets published Cummins fuel specifications. 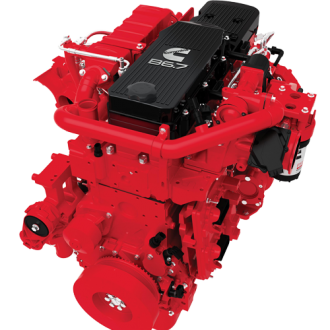 Expect the same high level of performance, reliability and fuel economy with the Cummins ISL9 EPA 2010 engine as you do with today’s ISL. The ISL9 has one of the highest power-to-weight ratios in its class with heavy-duty features like replaceable wet liners. It also features the XPI fuel system – the same technology that’s used in the ISX15. These advances combined with an improved Electronic Control Module (ECM) and improved air flow, allow the ISL9 to run stronger and with greater responsiveness than ever before. Ratings range from 345-380 hp with a maximum 1300 lb-ft of torque.